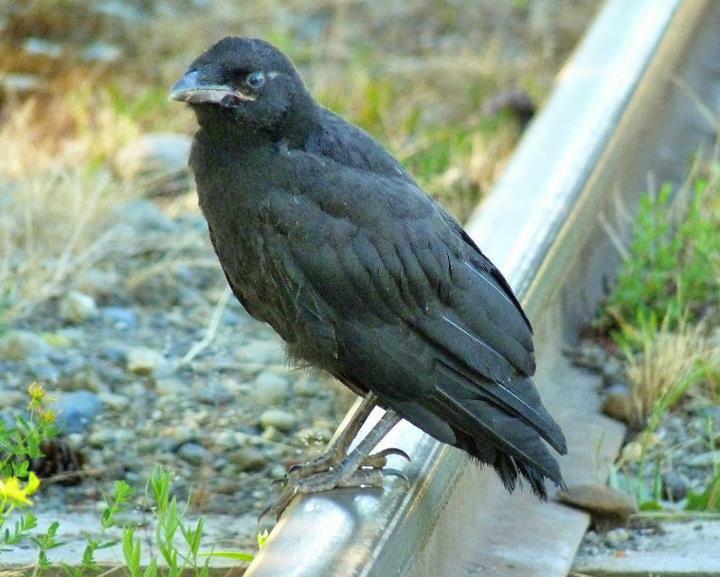 BC Forest Discovery Centre: Introducing Joey the Crow! Joey is a fledgling crow that apparently fell out of his nest last week. Recently he has been hanging out on the tracks behind the bunkhouses. His parents feed him frequently and he does not seem to be in distress so we have left him undisturbed. Every time the locomotive comes around though, he hops off the tracks at the very last second - giving the engineer quite a scare sometimes when he cuts it a little too close! Peter has nicknamed him Joey - and so he has been dubbed by the other staff members! Above is a photo of Joey, yesterday morning, resting on the tracks in the shade.